Mr L ventured bravely forth on Friday and did the supermarket shopping without me. I stayed home, got four loads of laundry out on the line and kept the dogs company. 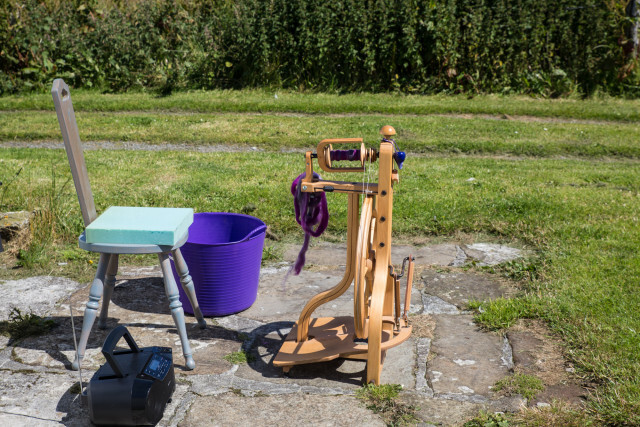 I managed to spin around one third of the remaining purple roving but overall don’t really know where my time went to. The forecast for the weekend was good and as Mr L had brought home several bottles of Leffe, an impromptu Saturday barbecue seemed like a good idea. In the event, the weather did not quite play ball but was just about warm enough for eating outside. He cut the grass and I prepped salads and marinated meat. Barbecues are quite straightforward when planned. Impromptu ones can be a little peculiar when making do with what happens to be in the fridge. 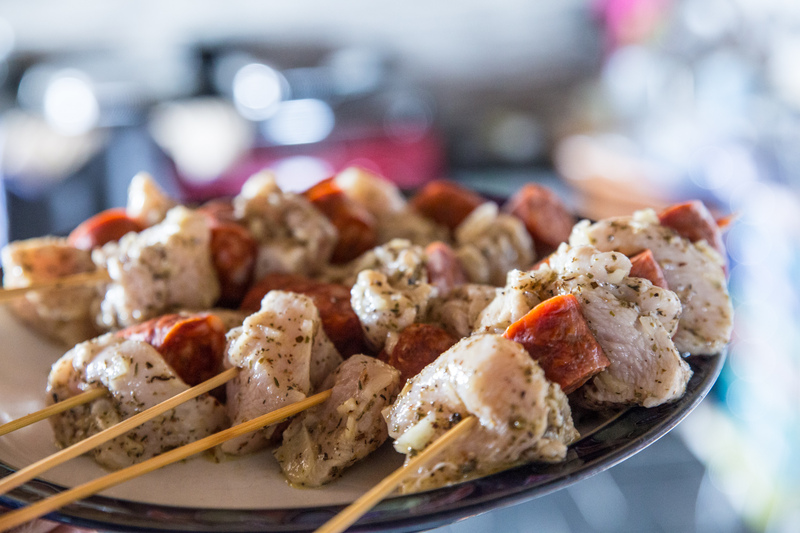 In this instance I made skewers from chicken breasts and Chorizo sausage. Vine tomatoes, a green salad and a potato salad went alongside and I made some barbecue sauce and crisped up a baguette on the coals. 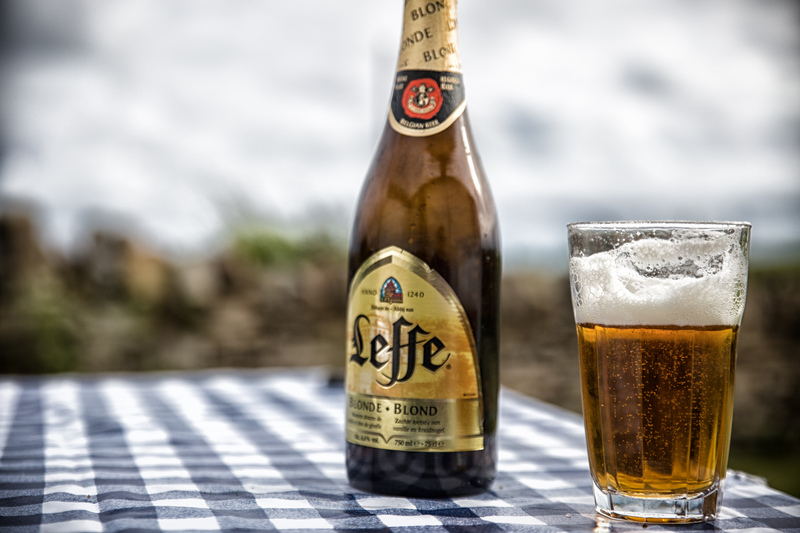 The Leffe was the main thing though and what doesn’t go better than when washed down with a bottle of the Belgian? We polished off with some balsamic-marinated strawberries with meringues, chocolate ice cream and cream. It was not truly barbecue weather but as neither of us is all that fond of the sun, it was actually quite pleasant. We did not mind wearing an extra layer of clothing and the flies were not too much trouble either. We enjoyed just sitting and chilling, listening to the chattering of the swallows and tossing crumbs to a cheeky and very bold sparrow. Today we had the weather previously advertised for yesterday. Mr L cleaned and de-nested the guttering in the front porch and then rewired the rear lights on Brunhilde to set them up for right-hand drive in readiness for her MOT. I took Morgana outside to play and we worked in the fresh air for the first time this year. I had been panicking about having my skeins ready in time for the Show as they need to be submitted on Thursday evening this week. Happily I managed to spin all of the remaining singles of the purple BFL today and can now ply tomorrow, then wash on Tuesday and re-skein on Wednesday; thereby squeaking in by the skin of my teeth. I can’t claim that this rushed spinning is any good but at least it is another pair of skeins with which to populate the show bench. 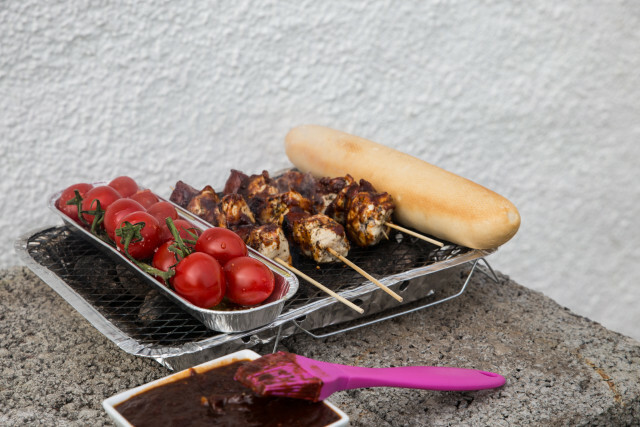 We ate outside again but stuck to salad and resisted all temptation to go to the shop for another disposable barbecue. I shall need anti-histamines tonight – my skin is already red, sore and itching. Damn. The doily is in hibernation and in need of a large measure of tinking. It will not be in the Show. My prize yarn arrived. It is rather more turquoise in colour than the donor’s photo suggested. Nobody has claimed it yet and I am leaning towards making a second Curl with it. A set of puzzles that I had ordered also arrived on Friday. I intend to use them as photo material and then to give them to Mr L for his birthday. Charge batteries and clean lenses in readiness for Friday. It’s a makedo until I get around to felting a seat pad.